Shot this hog yesterday evening with a hybrid I made, sitka spruce shaft tipped with a Woodsman. 15 yd shot, went down in sight. 125lb(guestimate) boar. Pig #3 of 2005. Congrats. Very nice picture too. 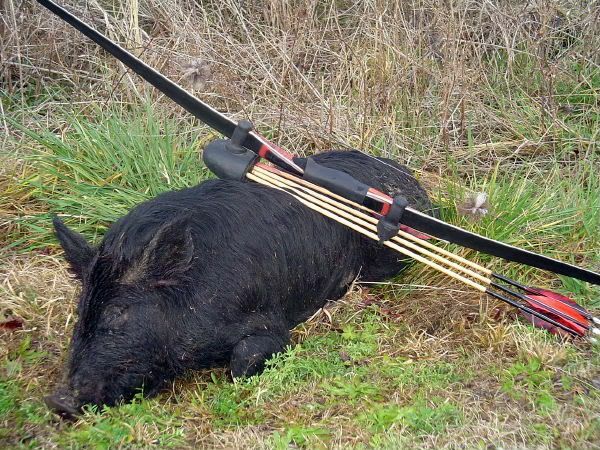 Nice pig, a beautiful bow and I really like your arrows. Sealed the deal with a sweet set up. congratulations on your harvest! thats a good looking pig, and a good looking picture! where in SC did you kill him? Slimpkins, I'm about 30-45 minutes west of Myrtle Beach. Nice Job, Nice Bow, and Nice Pic! O.K. Now I'm geting fired up! Awesome bow, arrows, pig and picture very nice. Great - all of it. I used to hunt pig and deer near Sumter (not far from there) and loved it. Haven't been down in a couple years plus now - durn it. I love the look of yer bow and it's "assesories".